Neuronal networks of cortical areas, including the hippocampus, consist of two major classes of neurons: excitatory principal cells and inhibitory non-principal cells or interneurons. 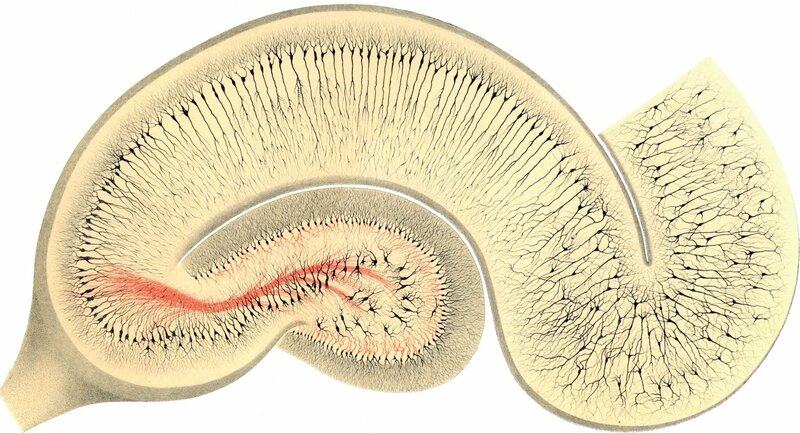 Figure 1: Principal cells of the hippocampus. Drawing by C. Golgi (1894). Principal cells form the majority (80­-90%) of the population and show homogeneous, but area-specific morphological features (Figure 1). They send axon collaterals to other areas and form large-scale networks. They are considered to be the workhorse of information processing. web-dg-fast-spiking-bc.jpg Figure 2: A fast-spiking basket cell. Note the dense axon collaterals in the cell body layer (g.c.l.). Interneurons are characterized by dense local axonal arbor (Figure 2) which enables them to control and coordinate the activity of large populations of local neurons. Although interneurons comprise only a small proportion of the neuronal population (~10%), they display a high degree of morphological, physiological and neurochemical heterogeneity and can be subdivided into several types. Diversity of these cells is believed to reflect the various functions these neurons play in the circuit. Basket cells (BCs) are a major type of interneuron. BCs form synapses onto the soma and proximal dendrites of their targets and provide fast and powerful inhibition. They determine if and when their postsynaptic neurons can discharge. They are also believed to play central role in the generation of fast oscillations.